Institutions have a significant impact on the region– and the area’s students. Students who invest in college degrees generally get higher paying jobs and earn more over a lifetime than those without degrees. So, while much has been said about escalating costs of higher education, the overall return on investment ROI of higher education is positive. ROI is a business term that can also apply to nonprofit higher education institutions. They’re multimillion dollar organizations that spur economic development and enhance the quality of life–not only by educating and training professional workers, but also through research, innovation and community engagement. We spoke with area higher education leaders about ways their campuses benefit Hoosiers. “ TWO-THIRDS OF NEW JOBS REQUIRE SOME KIND OF POSTSECONDARY EDUCATION,” says former Indiana Lt. Governor Sue Ellspermann, who became president of the statewide Ivy Tech Community College system in July. Former Indiana Lt. 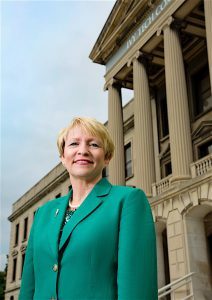 Governor Sue Ellspermann became president of the statewide Ivy Tech community college system in July. The move marks a return to higher education for Ellspermann, who established the Center of Applied Research and Economic Development at the University of Southern Indiana (USI) and has taught at USI as well as the universities of Evansville and Louisville. As lieutenant governor, Ellspermann was vice chair of the Indiana Career Council charged with aligning the state’s education and workforce development system with the needs of employers. Her career experience will serve her well as she takes on the challenge of helping employers find qualified candidates to fill existing jobs. Ellspermann says employers across the state look to Ivy Tech to develop the kind of workforce they need. “Two-thirds of new jobs require some kind of postsecondary education,” she says, noting that only about 40 percent of Indiana workers have those qualifications. Ellspermann wants to raise that to 60 percent of Hoosier workers by 2025–a goal set by the Lumina Foundation. “If we don’t produce those degrees and credentials, employers will hire from other states,” she says. Ivy Tech students pay half as much tuition as those at other state institutions. “Affordability is certainly a key part of accessibility.” And Ivy Tech is agile enough to develop new programs as the job market changes. Ellspermann is eager to get data, soon to be released by the Indiana Department of Workforce Development, forecasting statewide demand for 800 types of jobs. “Our task is to line up those numbers with programs in areas where they’re most needed and to recruit students into the programs,” she says. When Ellspermann entered the Ivy Tech presidency, Jim Dworkin retired as chancellor of Purdue North Central (PNC) after 16 years at the helm. He will continue to hold a faculty position at Purdue University’s Krannert School of Management. 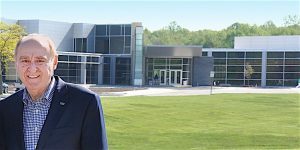 Dworkin’s departure comes at a pivotal moment, with the merger of PNC and Purdue Calumet to form Purdue Northwest, under the leadership of Chancellor Thomas Keon. Dworkin says the merger has financial advantages that will strengthen the regional university. Faculty on both campuses are collaborating on teaching and research, he notes, and students are reaping benefits. When Dworkin became chancellor in 2000, PNC had six bachelor’s degree programs and about 30 associate degrees. By the time he retired, Ivy Tech had taken over associate degree programs and PNC offered 24 bachelor’s degrees. front of the new James B. Dworkin Student Services and Activities Complex. In May, Dworkin achieved one of his key goals when the new James B. Dworkin Student Services and Activities Complex opened in time for spring graduation. “One of the proudest moments of my life was having the last graduation ceremony I’ll preside over held on campus, rather than at Valparaiso University,” he says. Some two-thirds of Purdue Northwest students are first generation and, according to Dworkin, “Once the first generation completes college, they’ll raise their families with the expectation of attending college as well. Chancellor William Lowe, the head of Indiana University Northwest since July 2010, believes it’s important for higher education to be businesslike and use resources efficiently. He notes that, as a complex organization with more than 600 employees and some 6,000 students, IU Northwest is a significant contributor to the economy. To measure the ROI for its graduates, IU Northwest keeps track of the rate of employment and kinds of jobs alumni obtain. Lowe says about 75 percent of IU Northwest students stay in the region and are employed here after graduation. Besides becoming productive professionals, the university’s graduates become what Lowe calls “fully engaged citizens.” Undergraduates are encouraged to get involved in community service. In 2015, IU Northwest students contributed $154,000 in service hours to the region, according to Lowe. Faculty and students also provide consulting services to local businesses and organizations that result in less tangible but no less significant benefits, Lowe adds. Regional universities like IU Northwest strive to make a college education affordable, with annual tuition of $6,000 to $9,000 a year, Lowe says. Indiana University offers a financial literacy program called MoneySmarts to help students make informed decisions about managing their money and reducing their overall student debt. The Office of Financial Literacy introduces MoneySmarts during student orientation. Through ongoing educational workshops, one-on-one meetings and annual financial aid borrowing reports, students gain a clearer understanding of their personal financial situation. 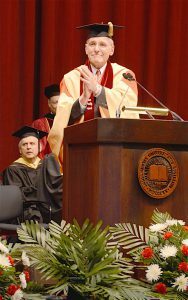 “FULLY ENGAGED CITIZENS” Indiana University Northwest Chancellor William J. Lowe addresses the Class of 2016 at the 50th Annual Commencement Ceremony this past May. The most visible milestone of Chancellor Lowe’s six-year tenure is the $45 million Arts and Sciences Building, set to open next spring on Broadway in Gary. The building will feature a 500-seat state-of-the-art theater for fine and performing arts performances open to the public. And it will strengthen the partnership between IU Northwest and Ivy Tech Northwest by making it easier for Ivy Tech students to transfer and complete bachelor’s degrees at IU Northwest. Ivy Tech will use a third of the new building for a student services center, science labs and faculty offices. “THEY’VE COME TO LEARN AND GROW” Mark Heckler, president of Valparaiso University, says the faith-based institution’s goal is to prepare students to lead and serve in both church and society. 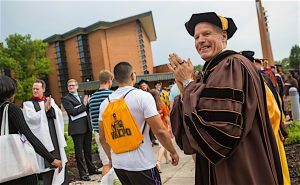 Heckler became Valparaiso University president nine years ago, after serving as provost at the University of Colorado. He has found that universities benefit by using sound business practices but, he says, “I would argue that, even though I use business practices to be a good steward of resources, a university is not a business. Valparaiso University’s mission as a faith-based institution is to prepare students to lead and serve in both church and society. The university doesn’t require students to engage in volunteer activities but, according to Heckler, student volunteers contributed 268,000 hours of community service in 2015. And, as part of their academic programs, student interns provide support for small businesses and nonprofit organizations. The university’s faculty and staff are also deeply involved in the community, serving on commissions and boards and volunteering time and energy to support local causes. “We foster a culture of service here,” Heckler says. The university provides cultural enrichment to the public through the Brauer Art Museum, theater productions, athletic events and seasonal celebrations at the Chapel of the Resurrection, which is credited with being North America’s largest college chapel. Like other heads of academic institutions, Heckler is accustomed to fielding questions about the value of higher education when weighed against the amount of debt students take on to earn their degrees. He cites statistics from sources, such as the Brookings Institute, indicating a wide income gap between college graduates and those without degrees. “Over a lifetime, those with a bachelor’s degree will earn $1 million more than an individual with a high school degree,” he says. The university pays close attention to whether students are getting jobs and are able to pay back student loans. For the past 20 years, alumni have been surveyed six months after graduation to find out whether they’re employed and what they’re earning. The surveys consistently show that 90 percent are employed and are either satisfied or highly satisfied with their education. Heckler says the most important function of higher education is to prepare people to be informed citizens–a bedrock of a democracy.